Sigmund Freud called dreams the “royal road to the unconscious,” but to bestselling author and world-renowned dream explorer Robert Moss, they are more: portals to the imaginal realm, a higher reality that exists at the intersection of time and eternity. The traveler’s tales in Moss’s new book, Mysterious Realities: A Dream Traveler’s Tales from the Imaginal Realm, are just-so stories in the sense that they spring from direct experience in the many worlds. As you journey from the temple of the Great Goddess at Ephesus to an amazing chance encounter on an airplane, from Dracula country in Transylvania to the astral realm of Luna, you’ll confirm that the doors to the otherworld open from wherever you are. You’ll see what it means to live on a mythic edge and to make a deal with your personal Death for a life extension. At any moment, you may fall, like the author, into the lap of a goddess or the jaws of an archetype. We hope you’ll enjoy this interview with the author about Mysterious Realities. What is “dream travel”? How do we become dream travelers? In ancient and indigenous understanding, dreaming is traveling. In big dreams, we make visits and receive visitations. We travel across time and space and to places where the dead are alive, as well as to alternate realities. Once we connect with our dreams and wake up to what is going on, we can begin to develop the practice of lucid dream travel. An ideal departure lounge is the half-dream state of what sleep researchers call hypnagogia. In the middle of the night or the early morning, you find yourself drifting between asleep and awake. If you can train yourself to maintain a state of relaxed attention in this in-between state, you will notice that you may be receiving a whole menu of possibilities for lucid dream travel. This twilight state is a good place to become aware of your ability to travel beyond the body. I often find myself lifting out of the body quite effortlessly in this state. Sometimes when I am very tired, I simply rest half in and half out of my physical form. Sometimes I float up to the ceiling. Quite often I like to go flying like a bird to places far away. This is one of the royal roads to lucid dreaming. The other is a practice I call “dream reentry,” which is when a dream has some energy and you choose to consciously go back into the dream to continue it. You may want to reenter a dream to clarify what was going on, or talk to your deceased grandmother, or explore a parallel world, or scout out a possible future. You may need to reenter a dream because there are terrors to be overcome, or a mystery to be explored, or simply because you were having fun and adventure and would like to have more. Many of the stories in Mysterious Realities involve awakening to the possibility that we are living parallel lives in parallel worlds. How can we explore our own parallel worlds? In physics, the hypothesis of the “Many Interactive Worlds” suggests that we live, right now, in one of countless parallel universes that impact one another. Part of the secret logic of our lives may be that our paths constantly interweave with those of numberless parallel selves. The gifts and failings of these alternate selves may influence us in ways that we generally fail to recognize. We are connected to our parallel selves in a multidimensional drama, and this may generate events in all our parallel lives that may appear as “chance” to those who do not understand the trans-temporal patterns. The hidden hand suggested by synchronistic events may be that of another personality within our multidimensional family, reaching out to us from what we normally perceive as “past” or “future” or from a parallel or other dimension. When we experience déjà vu and feel certain that we have been in a certain situation before, this may mean that we are close on the heels of a parallel self. Serial dreams, in which we find ourselves returning to the same people and places, may also be glimpses of a continuous life of a parallel self in a parallel world, in which different choices were made. Physicist Brian Greene speculates that we all have “endless doppelgangers” leading parallel lives in parallel universes. Once you have mastered serial dreaming, you may be ready to journey as a lucid dream traveler into a parallel life to dismiss old regrets and claim gifts and knowledge from your selves who made different choices. This can effect a quantum shift in your present reality and life story. The stories in Mysterious Realities are full of encounters with the dead, both interactions with the deceased and visits to places where the dead are living on the Other Side. Is contact with the deceased really as natural and easy as you suggest? I am often among the dead in my dreams. Sometimes I remember that they are dead, and other times I don’t. My father has come many times since his death with helpful advisories for me and our family. Sometimes my dream travels take me to new environments on the Other Side where the dead are enjoying new lives. They show me around, and I learn firsthand about this new lifestyle and the real-estate options available after death. Contact with the deceased, especially in dreams, isn’t weird or unusual or even truly supernatural. It happens for any of three reasons: the dead have never “left” and are still with us; the dead want to visit us from wherever they are; or we travel to the realms of the dead where they are now living. The immense body of scientific research and data on near-death experiences (NDEs) is evidence of the survival of consciousness after the physical body has closed down. When you become a conscious dream traveler, you confirm through your own experience that awareness is not confined to the body and brain and therefore is able to survive death. You are ready to learn that healing and forgiveness are always available across the apparent barrier of death and to develop your personal geography of the afterlife. There is a world between time and eternity with structures created by thought that outlast anything on Earth. This is the imaginal realm. You may enter it through the gate of dreams, or the gate of death, or on nights when you drop your body like a bathrobe. Here you will find schools and palaces, places of adventure, healing, and initiation. The imaginal realm is a fundamental ground of knowledge and experience. In this realm human imagination meets daimons — take on guises humans can begin to perceive and understand. The great medieval Sufi philosopher Suhrawardi insisted both on the objective reality of the imaginal realm and that the way to grasp it is the way of experience: “Pilgrims of the spirit succeed in contemplating this world, and they find there every object of their desire.” To know the realm of true imagination, you must go there yourself. Happily for you — once you wake up to what is going on — the doors may open to you any night in dreams, or in the fertile place between sleep and waking, or in a special moment of synchronicity when the universe gets personal. 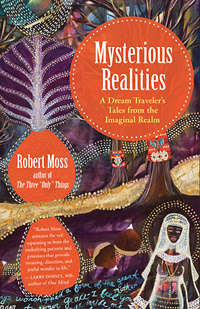 Robert Moss is the author of Mysterious Realities and numerous other books about dreaming, shamanism, and imagination. He is a novelist, poet, independent scholar, and the creator of Active Dreaming, an original synthesis of dreamwork and shamanism. He leads creative and shamanic adventures all over the world. Visit him online at www.mossdreams.com.